Hilda & Dave Regier. Family photo. David "Dave" Viktor Regier: educator and churchman; born 16 July 1933 in Lymburn, Alberta, Canada to Abraham Peter Regier (18 February 1895-12 November 1995) and Margaretha (Kroeger) Regier (27 March 1896-20 June 1988), the eighth child of nine and the 2nd son. He married Hilda Braun (1933- ), daughter of Jacob and Sarah (Rempel) Braun, on 25 July 1953 in the Leamington United Mennonite Church. They had three children, two sons and a daughter. In 1943 the Regier family moved to Virgil, Ontario. David attended Eden Christian College for his first year of high school, and completed the next four years at United Mennonite Educational Institute in Leamington. He was baptized at the Niagara United Mennonite Church in 1952. 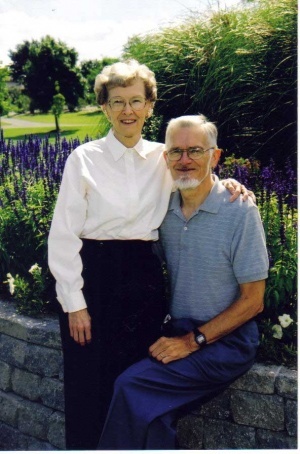 He was involved in Grace Mennonite Church (St. Catharines) from its origin in 1956 until his death on the 8 May 2004. Dave Regier started his working career as a tool and die maker at McKinnon Industries (General Motors) in St. Catharines. He enrolled in teachers’ college in Hamilton in 1959 and then worked with Special Education classes both in elementary and secondary levels. In 1989 he retired as a Special Education Consultant, having worked 29 years for the Lincoln County Board of Education. During this time he completed a university degree with a major in Psychology and a minor in Music at McMaster University (Hamilton), followed by a master’s degree in Education from Niagara University in New York State. Dave loved committees. At the local church he served as council chairman, treasurer, secretary, deacon, Sunday school teacher and worship leader. Beyond the local church some of the committees included: Mennonite Conference of Eastern Canada Theological Concerns Council, Conrad Grebel College Board of Governors, Congregational Resources Board of Conference of Mennonites in Canada, Canadian Mennonite Board, Mennonite Publishing Service (Mennonite Reporter), Mennonite Foundation of Canada, Council for Exceptional Children, Heritage Bookstore and Friends of the Mennonite Centre Ukraine. Regier worked with Silver Lake Mennonite Camp from its beginning in 1961. He was a counsellor, chairman and secretary-treasurer of the Board of Directors and assisted with building projects and fundraising. He once hand-painted 300 cards for campers. Another of Dave’s main interests was his Mennonite heritage which included compiling a large genealogical database, travelling to the former Soviet Union, and meeting with relatives. It was his idea to start the first varenecki (perogy) supper in the Niagara Peninsula in 2002 as a fundraiser in support of the Mennonite Centre in Ukraine. With the support of his wife Hilda, Dave was able to be generous with his time, skills and finances which included supporting the Mennonite church and many other charities. He died of cancer and is buried in the Niagara Lakeshore Cemetery. "Remembering the Life and Faith of Dave Regier. . ." Funeral bulletin. Grace Mennonite Church, St. Catharines, Ontario (15 May 2004). Foundation Info: Newsletter of Mennonite Foundation of Canada 11, No. 2 (May 2004). The Woodbox: the Newsletter by, and for, the Friends of Silver Lake (Spring 2004). Klassen, Maria H. "Regier, David Viktor (1933-2004)." Global Anabaptist Mennonite Encyclopedia Online. June 2011. Web. 25 Apr 2019. http://gameo.org/index.php?title=Regier,_David_Viktor_(1933-2004)&oldid=96173. Klassen, Maria H. (June 2011). Regier, David Viktor (1933-2004). Global Anabaptist Mennonite Encyclopedia Online. Retrieved 25 April 2019, from http://gameo.org/index.php?title=Regier,_David_Viktor_(1933-2004)&oldid=96173. This page was last modified on 23 August 2013, at 14:47.